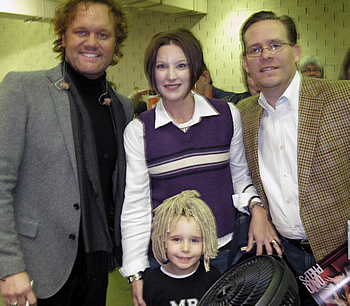 My youngest son, Will, has been a big fan of the Gaithers since he was about 2 years old. (He will be 7 this year). His hero is David Phelps. For his 5th birthday, almost two years ago, he wanted a “Gaither Party.” Well, I have to say that was not easy! You cannot go to Party City or Wal-Mart and get plates, napkins, cups and tablecloths with Bill and Gloria’s picture on it! I made up invitations and sent them out. It was a birthday party “Gaither Homecoming style.” The cake had the picture of Will with his autographed photo of Bill and Gloria. Everyone came dressed as their favorite Homecoming person. My oldest son dressed as Wes Hampton and my youngest son dressed as David Phelps. 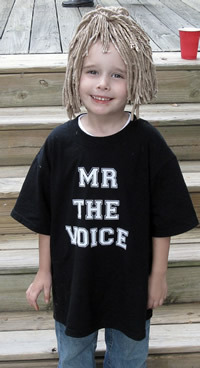 I made him a wig out of a mop and made him a T-shirt that says, “Mr. The Voice.” He had a poster board that said, “David Phelps, LIVE” and he performed two or three songs “with” David as the Legacy of Love: David Phelps Live video played behind him. His gift for his birthday that year was to see the Vocal Band in concert at the Hampton Coliseum. He wanted to dress in his “David Phelps” attire for the event. He went to the concert adorned in mop wig and “Mr. The Voice” T-shirt with his favorite microphone in hand. He was a hit with everyone who saw him. During intermission, he was able to meet David, Wes and Mark. Everyone who saw him said, “Has David seen him?” The people at David’s table were so gracious to make sure that my son was able to meet his hero. 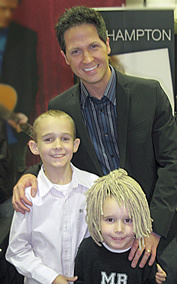 He has an autographed picture of David, Bill and Gloria and Jason Crabb hanging on his wall in his room. He hopes to have many more autographed pictures on his wall! My son doesn’t just listen to the music, but he watches the DVDs and worships along with them. He is so excited to be seeing the Vocal Band again this year. He has already decided he wants to wear his mop wig and T-shirt so he can look like David Phelps.